In March of 2016, I visited Cuba to learn more about the people and an educational system that is producing a highly literate population, which has one of the highest literacy rates in the world. 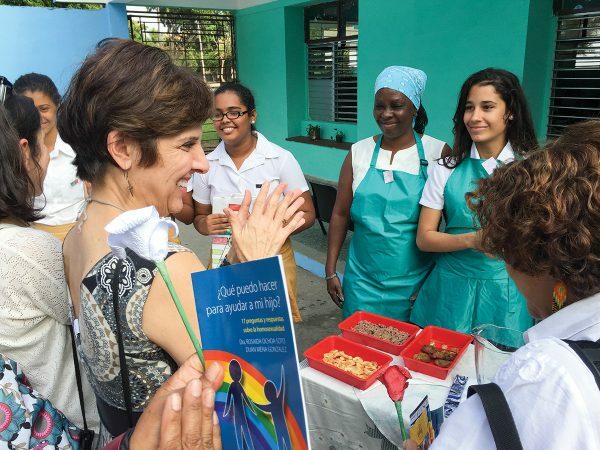 Our group brought along educational supplies to deliver to a school in Havana. On that visit, I was able to get in touch with the Cuban teachers' union (Sindicato Nacional de Trabajadores de la Educacion, la Ciencia y el Deporte SNTECD) and was invited to meet with them in their office in Havana. My contact, Gertrudis Simon Pineda, Executive Board member of the national union in charge of international relations, set up a meeting for us with the Secretary General of the national union Ismael Drullet. SNTECD has close to half a million members that include university professors, elementary and secondary school teachers, and all the education workers in the system. They have relationships with teacher unions in many countries of the world and were very interested in developing a relationship with teacher unions in the United States. They felt that as our two govern- ments were moving toward normalized relations, public school workers in both countries should connect and learn from each other about our education systems. Inside a classroom at the Fernando Alonso National School of Ballet, one of the school sites visited by Eugene EA members. At that meeting they extended an invitation to us to come to Cuba for an an- nual international education conference, Pedagogia 2017, in Havana from Jan. 30 to Feb. 3, 2017. 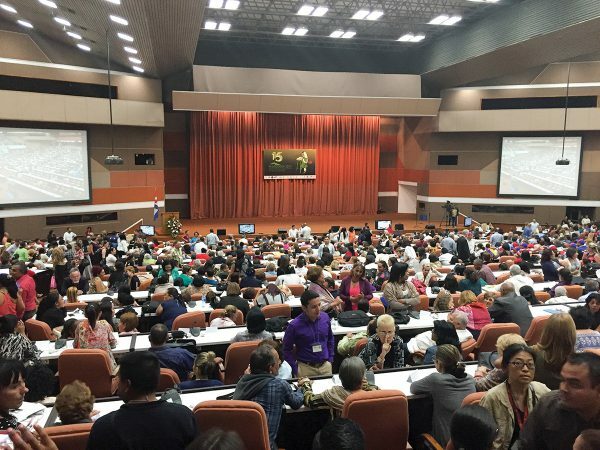 The Cuban Ministry of Educa- tion, UNESCO, Unicef, Confederacion de Educadores Americanos (CEA) and others organize the annual international conference. Part of the conference’s focus is international solidarity in defending public education. Tad Shannon, our Eugene Education Association President, was very supportive of this effort from the beginning. EEA has had a history of international solidar- ity with teacher unions. In the 1980s and 1990s our local Human and Civil Rights Committee had sister union relationships with several Latin American countries in- cluding Mexico, Honduras, El Salvador and Nicaragua. We hosted delegations from these countries, organized tours of the US for them and sent our members to Mexico. This year's visit to Cuba would continue that tradition. They have a lot to learn from us and we from them. We were able to raise the money through fundraising and financial support from OEA and EEA; members of the delegation also used their own money to pay for the expenses. EEA set up a process for picking delegates for the conference and a five-member delegation was selected. Being bilingual was a top priority, since the conference’s social language was Spanish. We wanted to learn more about the successful literacy program in Cuba, learn about the struggle against racism, sexism, and classism, and further develop relationships with the teachers union and possibly develop a sister school relationship with a Cuban school. We also wanted to learn strategies from educators in other countries on how to defend public education. We met all our goals and learned much more. Over 3,000 educators attended the conference from 51 countries. We were among the few US educators at the conference. The majority came from Latin American countries, Africa and Europe. George Sher- idan, Executive committee member of the NEA, represented NEA. This was the first social contact between NEA and SNTECD, and they hope to continue this relationship. We are in contact with George and hope to work with him on future projects. We also met with the leadership of the SNTECD, specifically Ismael Durret, Secretary General (president of the national union). At the meeting we presented them with an invitation from Hanna Vaandering, OEA president to come to Oregon and attend our RA. We also extended an invitation from superintendents from Eugene 4J and Bethel school districts to come to Eugene and visit our schools. They were open to work on that for 2018. Most of us spoke Spanish and attended workshops, lectures and visited several schools during the conference. Our delegation was impressed with the priority the Cuban society places on education. Education is considered to be a human and civil right of every Cuban citizen. This poor, third world country has one of the highest literacy rates in the world, 98 percent, and provides free education from preschool to graduate school. Before the revolution, half of the population was illiterate. One of the first actions taken after the revolution was to start a literacy campaign that reached the most remote villages in the countryside. Cubans also see workers’ rights as human rights and have had a favorable political environment for union organizing. The role of the unions in a socialist system is very different from the unions here in the U.S. They work in a collaborative way with the Ministry of Education, advocating for education workers and education policies. The wages of teachers, along with other public employees, are very low by our standards. They earn, on average, $25 per month. They benefit from the free health care system, free education system and a subsidized housing system. By law, the maximum class size in elementary schools is 25 students. The class over 25 gets a second teacher. In secondary schools, the maximum is 30. The system places high value on connecting schools to families and communities. Schools generally open at 6:30 a.m. and close 12 hours later, providing free morning and after-school care for working parents. The first part of the day is devoted to breakfast and free play. Core academics take place from 8:40-12:30, followed by lunch and games or recess. In the afternoon kids engage in a range of activities such as health, art, music and sports. After school programs are organized around areas of interest that the young people choose. 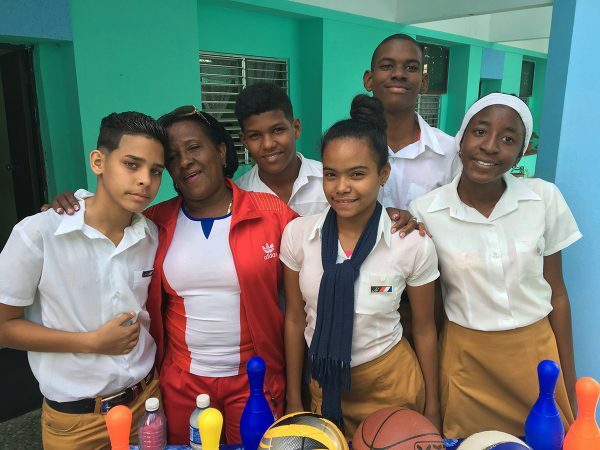 Educators from more than 51 countries attended the Opening Ceremony of Pedagogia 2017; Below: A Cuban teacher and her students; Bottom: Eugene's delegation visited a Special Ed classroom at Paquito Rosales Benitez School. 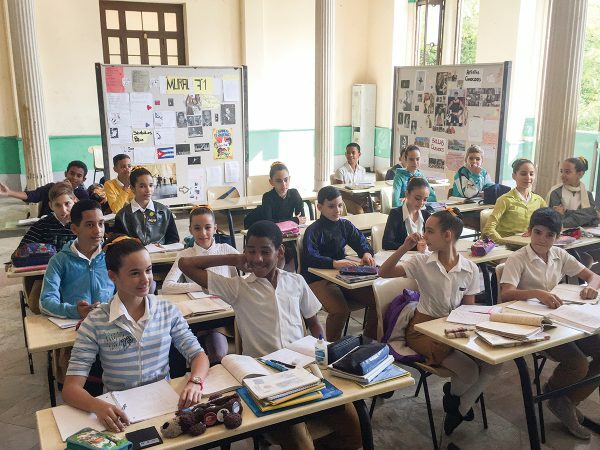 Cuba’s schools offer a variety of opportunities for the students in academics as well as offering incredible music and art education. Schools offer several hours a week of music and art for students at all levels. Students in every school we visited greeted us with musical and dance performances. It was impressive. On several occasions educators were astonished when we told them that music and art have been cut in many schools in the U.S. The values of peace, justice, cooperation and humanism are all important part of the curriculum. Cubans believe that by being grounded in their authentic culture and history, young people will become strong citizens that will contribute to further development of their country. Pride in Cuba’s independence is very evident. We were also impressed with the seeming lack of racism and sexism. The leadership in both the union and the education system seemed to be very inclusive. Women and people of color were leaders in the union, the schools we visited and at the conference. We also had an opportunity to meet and participate in workshops in which educators from Latin American countries and Europe shared their struggles. It seems that attacks on public education and unions is happen- ing not only here but in many other coun- tries. Privatization of schools is on the rise and anti labor laws and repression of teacher unions is occurring in many countries. Abby Lane, ESOL /Bilingual Instructor at the U of O College of Education and Retired ELL Coordinator in Eugene 4J, meets with middle school students. Another thing that struck us was the lack of crime. We found ourselves in different neighborhoods of Havana at all hours and never felt threatened or unsafe. This experience has had a profound effect on us. At a time when public education is under an unprecedented attack, we were able to see a system that is child-centered, protective of its youth and committed to providing quality education under challenging economic times. The products of this educational system were students who seemed confident, well adjusted and enthusiastic. 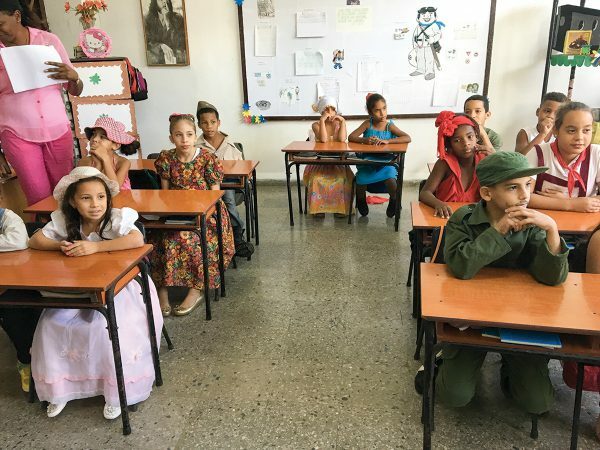 Cuba is a poor country with some economic and political problems, made much worse by U.S. embargo, but its treatment of its youth and the focus on education is exemplary. We have a lot to learn from them. We plan on developing this relationship further. We will be working on bringing a Cuban teacher to visit our schools, develop a sister school program with a Cuban school and will seek ways to provide material sup- port to counter the economic embargo that has hindered economic development of this small nation.